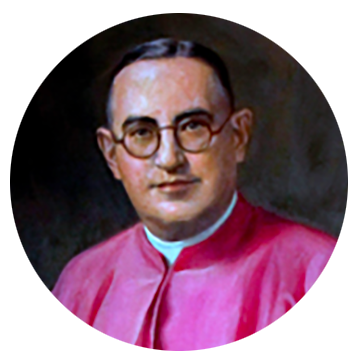 for Canonization of The Servant of God, Father Bernard John Quinn (1988-1940), according to the process prescribed in the Code of Canon Law under the supervision of the bishop of the Diocese of Brooklyn. It is the Guild’s desire to make the story of Father Quinn known and demonstrate that he lived a life of heroic virtue by educating persons about his life, work and interior prayer life. We encourage all persons to seek his intercession for spiritual and temporal favors. In addition, we wish to continue his legacy by working for causes to which he was devoted, advocating for the rights and dignity of the downtrodden and marginalized of our society and especially abused and neglected children by continuing to support such programs as Little Flower Children and Family Services of New York, founded by Father Quinn as the “Little Flower House of Providence” on October 26, 1930. Our Guild began on February 21, 2009 and is comprised of lay and religious members who volunteer their time and talent working for The Cause for Canonization that opened on January 13, 2008 by the Most Rev. Nicholas DiMarzio, Bishop of Brooklyn. Father Bernard John Quinn was declared “Servant of God’ by the Vatican Congregation of Saints on October 17, 2008. We welcome all people to join us in work and in prayer. Most importantly, we remember you in prayer at The Holy Sacrifice of the Mass offered each Monday for the living and deceased Guild Members and at the weekly novena to “The Little Flower”, St Therese of Lisieux, at St. Peter Claver Church, Brooklyn, New York.